This article is about the country. For the archipelago, see Comoro Islands. The Comoros (/ˈkɒməroʊz/ ( listen); Arabic: جزر القمر‎, Juzur al-Qumur / Qamar), officially the Union of the Comoros (Comorian: Umoja wa Komori, French: Union des Comores, Arabic: الاتحاد القمري‎ al-Ittiḥād al-Qumurī / Qamarī), is an island country in the Indian Ocean located at the northern end of the Mozambique Channel off the eastern coast of Africa between northeastern Mozambique, the French region of Mayotte, and northwestern Madagascar. The capital and largest city in Comoros is Moroni. The religion of the majority of the population is Sunni Islam. The sovereign state is an archipelago consisting of three major islands and numerous smaller islands, all in the volcanic Comoro Islands. The major islands are commonly known by their French names: northwestern-most Grande Comore (Ngazidja), Mohéli (Mwali), and Anjouan (Nzwani). In addition, the country has a claim on a fourth major island, southeastern-most Mayotte (Maore), though Mayotte voted against independence from France in 1974, has never been administered by an independent Comoros government, and continues to be administered by France (currently as an overseas department). France has vetoed United Nations Security Council resolutions that would affirm Comorian sovereignty over the island. In addition, Mayotte became an overseas department and a region of France in 2011 following a referendum passed overwhelmingly. It became part of the French colonial empire in the end of 19th century before becoming independent in 1975. Since declaring independence, the country has experienced more than 20 coups d'état or attempted coups, with various heads of state assassinated. Along with this constant political instability, the population of the Comoros lives with the worst income inequality of any nation, with a Gini coefficient over 60%, while also ranking in the worst quartile on the Human Development Index. As of 2008[update] about half the population lived below the international poverty line of US$1.25 a day. The French insular region of Mayotte, which is the more prosperous territory in the Mozambique Channel, is the major destination for Comorian illegal migrants who flee their country. The Comoros is a member state of the African Union, Francophonie, Organisation of Islamic Cooperation, Arab League (of which it is the southernmost state, being the only member state of the Arab League with a tropical climate and also entirely within the Southern Hemisphere) and the Indian Ocean Commission. Other countries near the Comoros are Tanzania to the northwest and the Seychelles to the northeast. Its capital is Moroni, on Grande Comore. The Union of the Comoros has three official languages—Comorian, Arabic, and French. ✪ A Tourists Guide to Moroni, Comoros! The first human inhabitants of the Comoro Islands are thought to have been Austronesian settlers travelling by boat from islands in Southeast Asia. These people arrived no later than the sixth century AD, the date of the earliest known archaeological site, found on Nzwani, although settlement beginning as early as the first century has been postulated. The islands of the Comoros were populated by a succession of peoples from the coast of Africa, the Arabian Peninsula and the Persian Gulf, the Malay Archipelago, and Madagascar. Bantu-speaking settlers reached the islands as a part of the greater Bantu expansion that took place in Africa throughout the first millennium. According to pre-Islamic mythology, a jinni (spirit) dropped a jewel, which formed a great circular inferno. This became the Karthala volcano, which created the island of Grande Comoro. Development of the Comoros is divided into phases. The earliest reliably recorded phase is the Dembeni phase (ninth to tenth centuries), during which each island maintained a single, central village. From the eleventh to the fifteenth centuries, trade with the island of Madagascar and merchants from the Middle East flourished, smaller villages emerged, and existing towns expanded. Many Comorians can trace their genealogies to ancestors from Yemen, mainly Hadhramaut, and Oman. Among the earliest accounts of East Africa, the works of Al-Masudi describe early Islamic trade routes, and how the coast and islands were frequently visited by Muslims including Persian and Arab merchants and sailors in search of coral, ambergris, ivory, tortoiseshell, gold and slaves. They also brought Islam to the people of the Zanj including the Comoros. As the importance of the Comoros grew along the East African coast, both small and large mosques were constructed. Despite its distance from the coast, the Comoros is situated along the Swahili Coast in East Africa. It was a major hub of trade and an important location in a network of trading towns that included Kilwa, in present-day Tanzania, Sofala (an outlet for Zimbabwean gold), in Mozambique, and Mombasa in Kenya. After the arrival of the Portuguese in the early 15th century and subsequent collapse of the East African sultanates, the powerful Omani Sultan Saif bin Sultan began to defeat the Dutch and the Portuguese. His successor Said bin Sultan increased Omani Arab influence in the region, moving his administration to nearby Zanzibar, which came under Omani rule. Nevertheless, the Comoros remained independent, and although the three smaller islands were usually politically unified, the largest island, Ngazidja, was divided into a number of autonomous kingdoms (ntsi). The Comoros served as a way station for merchants sailing to the Far East and India until the opening of the Suez Canal significantly reduced traffic passing through the Mozambique Channel. The native commodities exported by the Comoros were coconuts, cattle and tortoiseshell. French settlers, French-owned companies, and wealthy Arab merchants established a plantation-based economy that used about one-third of the land for export crops. After its annexation, France converted Mayotte into a sugar plantation colony. The other islands were soon transformed as well, and the major crops of ylang-ylang, vanilla, coffee, cocoa beans, and sisal were introduced. The next 30 years were a period of political turmoil. On 3 August 1975, less than one month after independence, president Ahmed Abdallah was removed from office in an armed coup and replaced with United National Front of the Comoros (FNUK) member Prince Said Mohamed Jaffar. Months later, in January 1976, Jaffar was ousted in favour of his Minister of Defense Ali Soilih. At this time, the population of Mayotte voted against independence from France in two referenda. The first, held on 22 December 1974, won 63.8% support for maintaining ties with France, while the second, held in February 1976, confirmed that vote with an overwhelming 99.4%. The three remaining islands, ruled by President Soilih, instituted a number of socialist and isolationist policies that soon strained relations with France. On 13 May 1978, Bob Denard returned to overthrow President Soilih and reinstate Abdallah with the support of the French, Rhodesian and South African governments. During Soilih's brief rule, he faced seven additional coup attempts until he was finally forced from office and killed. In contrast to Soilih, Abdallah's presidency was marked by authoritarian rule and increased adherence to traditional Islam and the country was renamed the Federal Islamic Republic of the Comoros (République Fédérale Islamique des Comores; جمهورية القمر الإتحادية الإسلامية). Abdallah continued as president until 1989 when, fearing a probable coup d'état, he signed a decree ordering the Presidential Guard, led by Bob Denard, to disarm the armed forces. Shortly after the signing of the decree, Abdallah was allegedly shot dead in his office by a disgruntled military officer, though later sources claim an antitank missile was launched into his bedroom and killed him. Although Denard was also injured, it is suspected that Abdallah's killer was a soldier under his command. A few days later, Bob Denard was evacuated to South Africa by French paratroopers. Said Mohamed Djohar, Soilih's older half-brother, then became president, and served until September 1995, when Bob Denard returned and attempted another coup. This time France intervened with paratroopers and forced Denard to surrender. The French removed Djohar to Reunion, and the Paris-backed Mohamed Taki Abdoulkarim became president by election. He led the country from 1996, during a time of labour crises, government suppression, and secessionist conflicts, until his death November 1998. He was succeeded by Interim President Tadjidine Ben Said Massounde. The islands of Anjouan and Mohéli declared their independence from the Comoros in 1997, in an attempt to restore French rule. But France rejected their request, leading to bloody confrontations between federal troops and rebels. In April 1999, Colonel Azali Assoumani, Army Chief of Staff, seized power in a bloodless coup, overthrowing the Interim President Massounde, citing weak leadership in the face of the crisis. This was the Comoros' 18th coup, or attempted coup d'état since independence in 1975. Azali failed to consolidate power and reestablish control over the islands, which was the subject of international criticism. The African Union, under the auspices of President Thabo Mbeki of South Africa, imposed sanctions on Anjouan to help broker negotiations and effect reconciliation. The official name of the country was changed to the Union of the Comoros and a new system of political autonomy was instituted for each island, plus a union government for the three islands was added. Azali stepped down in 2002 to run in the democratic election of the President of the Comoros, which he won. Under ongoing international pressure, as a military ruler who had originally come to power by force, and was not always democratic while in office, Azali led the Comoros through constitutional changes that enabled new elections. A Loi des compétences law was passed in early 2005 that defines the responsibilities of each governmental body, and is in the process of implementation. The elections in 2006 were won by Ahmed Abdallah Mohamed Sambi, a Sunni Muslim cleric nicknamed the "Ayatollah" for his time spent studying Islam in Iran. Azali honoured the election results, thus allowing the first peaceful and democratic exchange of power for the archipelago. Colonel Mohammed Bacar, a French-trained former gendarme, seized power as President in Anjouan in 2001. He staged a vote in June 2007 to confirm his leadership that was rejected as illegal by the Comoros federal government and the African Union. On 25 March 2008 hundreds of soldiers from the African Union and the Comoros seized rebel-held Anjouan, generally welcomed by the population: there have been reports of hundreds, if not thousands, of people tortured during Bacar's tenure. Some rebels were killed and injured, but there are no official figures. At least 11 civilians were wounded. Some officials were imprisoned. Bacar fled in a speedboat to the French Indian Ocean territory of Mayotte to seek asylum. Anti-French protests followed in the Comoros (see 2008 invasion of Anjouan). Following elections in late 2010, former Vice-President Ikililou Dhoinine was inaugurated as President on 26 May 2011. A member of the ruling party, Dhoinine was supported in the election by the incumbent President Ahmed Abdallah Mohamed Sambi. Dhoinine, a pharmacist by training, is the first President of the Comoros from the island of Mohéli. Following the 2016 elections, Azali Assoumani became president for a third term. The Comoros is formed by Ngazidja (Grande Comore), Mwali (Mohéli) and Nzwani (Anjouan), three major islands in the Comoros Archipelago, as well as many minor islets. The islands are officially known by their Comorian language names, though international sources still use their French names (given in parentheses above). The capital and largest city, Moroni, is located on Ngazidja. 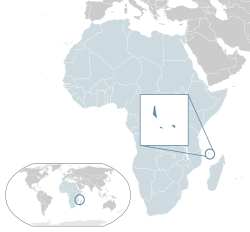 The archipelago is situated in the Indian Ocean, in the Mozambique Channel, between the African coast (nearest to Mozambique and Tanzania) and Madagascar, with no land borders. Ngazidja is the largest of the Comoros Archipelago, approximately equal in area to the other islands combined. It is also the most recent island, and therefore has rocky soil. The island's two volcanoes, Karthala (active) and La Grille (dormant), and the lack of good harbours are distinctive characteristics of its terrain. Mwali, with its capital at Fomboni, is the smallest of the four major islands. Nzwani, whose capital is Mutsamudu, has a distinctive triangular shape caused by three mountain chains – Sima, Nioumakélé and Jimilimé – emanating from a central peak, Mount N'Tingui (1,575 m or 5,167 ft). The islands of the Comoros Archipelago were formed by volcanic activity. Mount Karthala, an active shield volcano located on Ngazidja, is the country's highest point, at 2,361 metres (7,746 feet). It contains the Comoros' largest patch of disappearing rainforest. Karthala is currently one of the most active volcanoes in the world, with a minor eruption in May 2006, and prior eruptions as recently as April 2005 and 1991. In the 2005 eruption, which lasted from 17 to 19 April, 40,000 citizens were evacuated, and the crater lake in the volcano's 3 by 4 kilometres (1.9 by 2.5 miles) caldera was destroyed. The Comoros also lays claim to the Îles Éparses or Îles éparses de l'océan indien (Scattered Islands in the Indian Ocean) – Glorioso Islands, comprising Grande Glorieuse, Île du Lys, Wreck Rock, South Rock, Verte Rocks (three islets) and three unnamed islets – one of France's overseas districts. The Glorioso Islands were administered by the colonial Comoros before 1975, and are therefore sometimes considered part of the Comoros Archipelago. Banc du Geyser, a former island in the Comoros Archipelago, now submerged, is geographically located in the Îles Éparses, but was annexed by Madagascar in 1976 as an unclaimed territory. The Comoros and France each still view the Banc du Geyser as part of the Glorioso Islands and, thus, part of its particular exclusive economic zone. Politics of the Comoros takes place in a framework of a federal presidential republic, whereby the President of the Comoros is both head of state and head of government, and of a multi-party system. The Constitution of the Union of the Comoros was ratified by referendum on 23 December 2001, and the islands' constitutions and executives were elected in the following months. It had previously been considered a military dictatorship, and the transfer of power from Azali Assoumani to Ahmed Abdallah Mohamed Sambi in May 2006 was a watershed moment as it was the first peaceful transfer in Comorian history. Executive power is exercised by the government. Federal legislative power is vested in both the government and parliament. The preamble of the constitution guarantees an Islamic inspiration in governance, a commitment to human rights, and several specific enumerated rights, democracy, "a common destiny" for all Comorians. Each of the islands (according to Title II of the Constitution) has a great amount of autonomy in the Union, including having their own constitutions (or Fundamental Law), president, and Parliament. The presidency and Assembly of the Union are distinct from each of the islands' governments. The presidency of the Union rotates between the islands. Mohéli holds the current presidency rotation, and so Ikililou Dhoinine is President of the Union; Grand Comore and Anjouan follow in four-year terms. The Comorian legal system rests on Islamic law, an inherited French (Napoleonic Code) legal code, and customary law (mila na ntsi). Village elders, kadis or civilian courts settle most disputes. The judiciary is independent of the legislative and the executive. The Supreme Court acts as a Constitutional Council in resolving constitutional questions and supervising presidential elections. As High Court of Justice, the Supreme Court also arbitrates in cases where the government is accused of malpractice. The Supreme Court consists of two members selected by the president, two elected by the Federal Assembly, and one by the council of each island. In November 1975, the Comoros became the 143rd member of the United Nations. The new nation was defined as comprising the entire archipelago, although the citizens of Mayotte chose to become French citizens and keep their island as a French territory. The Comoros has repeatedly pressed its claim to Mayotte before the United Nations General Assembly, which adopted a series of resolutions under the caption "Question of the Comorian Island of Mayotte", opining that Mayotte belongs to the Comoros under the principle that the territorial integrity of colonial territories should be preserved upon independence. As a practical matter, however, these resolutions have little effect and there is no foreseeable likelihood that Mayotte will become de facto part of the Comoros without its people's consent. More recently, the Assembly has maintained this item on its agenda but deferred it from year to year without taking action. Other bodies, including the Organization of African Unity, the Movement of Non-Aligned Countries and the Organisation of Islamic Cooperation, have similarly questioned French sovereignty over Mayotte. To close the debate and to avoid being integrated by force in the Union of the Comoros, the population of Mayotte overwhelmingly chose to become an overseas department and a region of France in a 2009 referendum. The new status was effective on 31 March 2011 and Mayotte has been recognised as an outermost region by European Union on 1 January 2014. This decision integrates Mayotte in the French Republic legally « one and indivisible ». The Comoros is a member of the African Union, the Arab League, the European Development Fund, the World Bank, the International Monetary Fund, the Indian Ocean Commission and the African Development Bank. On 10 April 2008, the Comoros became the 179th nation to accept the Kyoto Protocol to the United Nations Framework Convention on Climate Change. The military resources of the Comoros consist of a small standing army and a 500-member police force, as well as a 500-member defence force. A defence treaty with France provides naval resources for protection of territorial waters, training of Comorian military personnel, and air surveillance. France maintains a few senior officers presence in the Comoros at government request. France maintains a small maritime base and a Foreign Legion Detachment (DLEM) on Mayotte. The Comoros is one of the world's poorest countries. Economic growth and poverty reduction are major priorities for the government. With a rate of 14.3%, unemployment is considered very high. Agriculture, including fishing, hunting, and forestry, is the leading sector of the economy, and 38.4% of the working population is employed in the primary sector. The Comoros is a member of the Organization for the Harmonization of Business Law in Africa (OHADA). The most common language in the Comoros is Comorian, or Shikomori. It is a language related to Swahili, with four different variants (Shingazidja, Shimwali, Shinzwani and Shimaore) being spoken on each of the four islands. Arabic and Latin scripts are both used, Arabic being the more widely used, and an official orthography has recently been developed for the Latin script. Sunni Islam is the dominant religion, representing as much as 99% of the population. A minority of the population of the Comoros, mostly immigrants from metropolitan France, are Roman Catholic. Comoros is the only Muslim-majority country in Southern Africa and the second southernmost Muslim-majority territory after the French territory of Mayotte. There are 15 physicians per 100,000 people. The fertility rate was 4.7 per adult woman in 2004. Life expectancy at birth is 67 for females and 62 for males. About fifty-seven percent of the population is literate in the Latin script while more than 90% are literate in the Arabic script; total literacy is estimated at 77.8%. [clarification needed] Comorian has no native script, but both Arabic and Latin scripts are used. This article incorporates text from the Library of Congress Country Studies, which is in the public domain. ^ "GINI index". World Bank. Retrieved 26 July 2013. ^ a b The first UN General Assembly Resolution regarding the matter, "Question of the Comorian island of Mayotte (PDF)", United Nations General Assembly Resolution A/RES/31/4, (21 October 1976) states "the occupation by France of the Comorian island of Mayotte constitutes a flagrant encroachment on the national unity of the Comorian State, a Member of the United Nations," rejecting the French-administered referendums and condemning French presence in Mayotte. ^ As defined by the Organization of African Unity, the Movement of Non-Aligned Countries, the Organisation of Islamic Cooperation, and the United Nations General Assembly: the most recent UN General Assembly Resolution regarding the matter, "Question of the Comorian island of Mayotte," United Nations General Assembly Resolution A/RES/49/18, (6 December 1994) states "the results of the referendum of 22 December 1974 were to be considered on a global basis and not island by island,...Reaffirms the sovereignty of the Islamic Federal Republic of the Comoros over the island of Mayotte". Several resolutions expressing similar sentiments were passed between 1977 (31/4) and 1994 (49/18). ^ "Subjects of UN Security Council Vetoes". Global Policy Forum. Archived from the original on 17 March 2008. Retrieved 27 March 2008. ^ "Article 33, Repertory, Supplement 5, vol. II (1970–1978)" (PDF). United Nations, Office of Legal Affairs (OLA). Archived from the original (PDF) on 6 October 2014. ^ a b "Anti-French protests in Comoros". BBC News. 27 March 2008. Retrieved 27 March 2008. ^ "Intrigue in the world's most coup-prone island paradise". economist.com. The Economist. Retrieved 25 January 2019. ^ "The Islands of the Moon". Aramco World. 47 (4): 40. July–August 1996. ^ Federal Research Division of the Library of Congress under the Country Studies/Area Handbook Program (August 1994). Ralph K. Benesch, ed. A Country Study: Comoros. Washington, D.C.: US Department of the Army. Retrieved 15 January 2007. ^ "French acquisition of Comoros" (PDF). Encyclopedia of Islam 1979, vol. v, p. 381. ^ Moorcraft, Paul L.; McLaughlin, Peter (April 2008) . The Rhodesian War: A Military History. Barnsley: Pen and Sword Books. pp. 120–121. ISBN 978-1-84415-694-8. ^ Christopher S. Wren (8 December 1989). "Mercenary Holding Island Nation Seeks Deal". New York Times. ^ Judith Matloff (6 October 1995). "Mercenaries seek fun and profit in Africa". 87 (219). Christian Science Monitor. ISSN 0882-7729. ^ Marlise Simons (5 October 1995). "1,000 French Troops Invade Comoros to Put Down Coup". New York Times. Section A; Page 10; Column 3. ^ "French Mercenary Gives Up in Comoros Coup". New York Times. Associated Press. 6 October 1995. Section A; Page 7; Column 1. ^ Kamal Eddine Saindou (6 November 1998). "Comoros president dies from heart attack". Associated Press. pp. International News. Archived from the original on 28 March 2015. ^ Moyiga Nduru (17 September 1997). "COMORO ISLANDS: Tension Rising in the Indian Ocean Archipelago". IPS-Inter Press Service/Global Information Network. ^ "COMOROS: The legacy of a Big Man on a small island". IRIN. ^ "Prehistoric fish offers rare glimpse of hidden sea life – Coelacanth (1953)". Abilene Reporter-News. 1953-02-23. p. 25. Retrieved 2017-06-18. ^ "70-million-year-old fish dissected – Coaelacanth (1975)". Redlands Daily Facts. 1975-05-28. p. 6. Retrieved 2017-06-18. ^ "Comoros 2001 (rev. 2009)". Constitute. Retrieved 23 April 2015. ^ a b "FUNDAMENTAL LAW OF THE UNION OF COMOROS (English excerpts)". Centre for Human Rights, University of Pretoria, South Africa. Archived from the original (Word document) on 9 October 2006. ^ AFRICAN ELECTIONS DATABASE, Elections in the Comoros. ^ "COMOROS: Reforming 'the coup-coup islands'". IRIN. ^ "Comoros: Referendum Approves Downscaling of Government". AllAfrica Global Media. 19 May 2009. Retrieved 20 May 2009. ^ "Forty-ninth session: Agenda item 36: 49/18. Question of the Comorian island of Mayotte" (PDF). United Nations General Assembly. 6 December 1994. Archived from the original (PDF) on 27 May 2008. ^ "unfccc.int KYOTO PROTOCOL – STATUS OF RATIFICATION" (PDF). Unfccc.int. Retrieved 25 August 2017. ^ Office of the Prosecutor, Situation on Registered Vessels of Comoros, Greece and Cambodia Article 53(1) Report, "Report of 6th November 2014"
^ Statement of the Prosecutor of the International Criminal Court, Fatou Bensouda, on concluding the preliminary examination of the situation referred by the Union of the Comoros: "Rome Statute legal requirements have not been met","Statement of 6th November 2014"
^ Ratha, Dilip; Sanket Mohapatra; Ani Silwal (2011). "The Migration and Remittances Factbook 2011: Comoros" (PDF). Worldbank.org. Retrieved 29 November 2016. ^ a b Office of the General Commissioner for Planning, Ministry of Planning and Regional Development (October 2005). "UNION OF THE COMOROS: POVERTY REDUCTION AND GROWTH STRATEGY PAPER (UPDATED INTERIM PAPER)" (PDF). ^ "Comoros: Financial Sector Profile". mfw4a.org. Archived from the original on 13 May 2011. Retrieved 15 January 2011. ^ "Rural Poverty Portal". ruralpovertyportal.org. ^ Population Division of the Department of Economic and Social Affairs of the United Nations Secretariat (2005) World Population Prospects: The 2004 Revision and World Urbanization Prospects: The 2005 Revision. ^ "FACTBOX-Relations between France and Comoros". Reuters. 27 March 2008. ^ "The World Factbook — Central Intelligence Agency". cia.gov. ^ "CIA World Factbook: Comoros". Cia.gov. Retrieved 15 January 2011. ^ "WHO Country Offices in the WHO African Region – WHO Regional Office for Africa" (PDF). Afro.who.int. Archived from the original (PDF) on 7 January 2010. Retrieved 1 June 2010. ^ "Comoros". 2005 Findings on the Worst Forms of Child Labor Archived 9 January 2014 at the Wayback Machine. Bureau of International Labor Affairs, U.S. Department of Labor (2006). This article incorporates text from this source, which is in the public domain. ^ "Université des Comores". Univ-comores.km. Retrieved 12 May 2017. ^ UNESCO Institute for Statistics, country profile of Comoros; 2004. ^ "Union of Comoros". Arab Cultural Trust. Archived from the original on 27 December 2016. Retrieved 29 November 2016. ^ "Comoros Islands: Islands & Beyond". comoros-islands.com. Archived from the original on 15 November 2016. Retrieved 29 November 2016. ^ "Accueil – Al-watwan, Quotidien comorien". Alwatwan.net. Retrieved 25 August 2017.